James Silva (Mark Wahlberg), an elite American intelligence officer, works with an underground task force called Overwatch. They're a team of highly skilled and unpredictable professionals who are tasked with the most dangerous assignments. 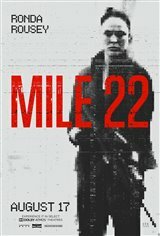 When an Indonesian man named Li Noor (Iko Uwais) says his government is planning an attack on the United States, Silva is given the job of smuggling him through the streets of Indonesia to a private getaway plane 22 miles away. Although he's aided by a top-secret tactical command unit in order to get the informant and the intel safely out of the country, they have to tackle corrupt police, criminal overlords and heavily armed locals en route, all hell-bent on taking them out before they reach their plane.